My sister Susan joined me in Ljubljana and after a quick trip to Lake Bled, we took a bus to the Istrian peninsula in Croatia. 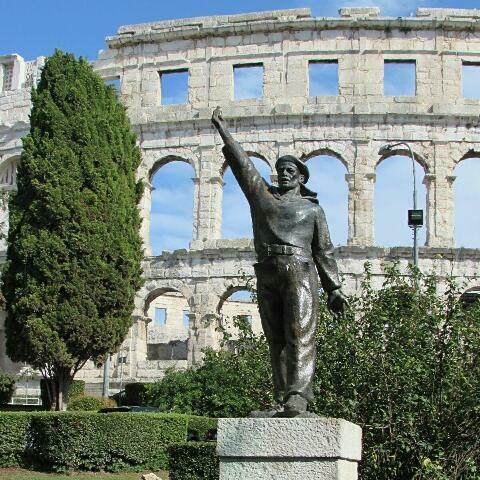 Istria is often compared with Italy (but cheaper!) and it is famous for truffles, wine, and olive oil. We based ourselves on the coast in Rovinj which was surprisingly wonderful for tourist town on the beach. We had a lot of great fish but one of our best meals was at a restaurant located inside a woman's house. She has set up tables in her living room (which overlooks the Adriatic) and she makes wonderful tapas in a very tiny kitchen. We spent a day exploring Rovinj and also traveled to Pula to see the first century Roman amphitheater. The interior of Istria has a lot of small medieval towns and beautiful scenery so we rented a car and spent two days exploring. The distances between the towns are small but the roads are narrow (lots of one lane roads) so we didn't get to as many places as we had planned. What we did see was pretty spectacular. We walked on the Motovun town walls, saw Hum, with 23 residents the smallest town in the world*, and visited Oprtalj where it seemed most of the town's housing was either falling down or in the process of being renovated. The next day we visited two more towns - Svetvincenat and Vodnjan. Vodnjan is mostly famous for St. Blaise's church which contains the mummified remains of saints who died hundreds of years ago - their bodies have mysteriously failed to decompose. We became good friends with the parish priest mainly because of our shared love of Robin Williams and the fact that we were dressed appropriately. He even dragged my sister out of the church to show her to a group of inappropriately dressed tourists who he had refused to admit. We left the church with a lovely gift and memories that will last a lifetime. 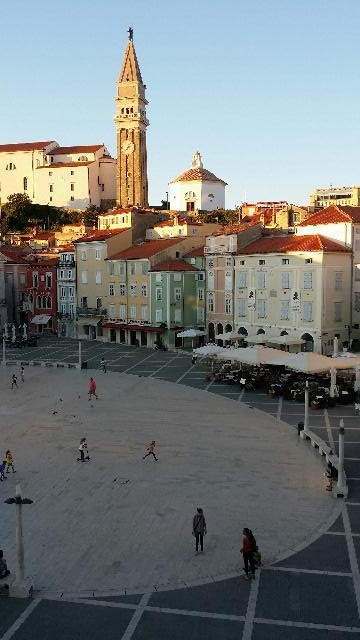 We spent the an afternoon and night in a wonderful hotel in Bale (a medieval town made entirely out of stone) before heading to Piran, on the Slovenian coast, and Trieste (another wonderful hotel) on the Italian coast. *It is the smallest town with a mayor. • If you park in a space with blue lines, you have to pay for parking. • I know how to use a ticket machine to pay for parking, a self-service gas station, and the automated check out at the grocery store. •In Croatia you can bet on all major sporting events including every MLB game. • If you want to visit Vodnjan, dress appropriately!